Windows 8 tablets aren't in good shape: Microsoft's OS gets plenty of hate for its desktop functionality, and many people aren't willing to pay premium prices for the ability to run Office--and not much else--on what amounts to be keyboard-less PCs. Indeed, with Windows 8 and Windows RT making up just 7.5 percent of the total tablet market, many manufacturers are fleeing what they perceive to be a sinking platform. It looks really bad, right? Not so fast. At Thursday's big Samsung event, the Korean tech giant might have just thrown Microsoft the life-preserver it needs to help keep Windows tablets in the game. Here are three ways Samsung can lend Microsoft a helping hand. After announcing another handful of Android smartphones (all with the name "Galaxy S4" and whatever noun Samsung decided to tack onto the end), the company surprised those in attendance by unveiling two new slates running Windows 8: the Ativ Q and the Ativ Tab 3. The Ativ Q is the more noteworthy of the two for its ability to seamlessly switch between Windows and Android, giving it access to a whole mess of software normally unavailable on Windows 8 devices. One of the key problems with Windows 8 and Windows 8 RT (and Windows Phone 8 too, for that matter) is the lack of mobile-optimized software available for the platform. Windows 8 has the benefit of being able to run full-blown desktop applications like Photoshop and Steam, but these software heavyweights aren't all that useful if you're on the go and don't have a mouse and keyboard plugged into your tablet. But by allowing the Ativ Q to dual-boot into both Windows and Android, users can enjoy apps made specifically for mobile while still having access to a full desktop environment. Granted, not all Android apps are winners, but at least Samsung is providing options for people who don't mind wading through a bit of junk to find a few gems. It's also possible that Samsung would create custom software for the Android side of the Ativ Q, something to help it further stand out from other Android and Windows slates. Samsung's idea to combine Android and Windows 8 isn't exactly unique: Earlier this year Asus launched an AIO desktop that transforms into a giant 18-inch Android tablet when you undock the screen. The combination doesn't really make sense for a tablet that takes up most of your coffee table, but feels just right on Samsung's more portable device. Samsung can also help mitigate Windows 8 tablet pricing problems. Microsoft's own Surface Pro runs high at $899 for the base 64GB model, while Dell's Latitude 10, laden with much more modest specs, retails for $500. It's difficult to convince people to drop such serious cash on a tablet when they can purchase a pretty decent laptop for the same price. A $500 price tag also puts Windows 8 tablet manufacturers in direct competition with Apple's iPad, the 800-pound gorilla of the mobile market. "Samsung has to reinforce the notion that a tablet experience doesn't have to break the bank," says Patrick Moorhead, president and principal analyst at Moor Insights and Strategy. So how will Samsung get there? By leveraging its own assets. Samsung is a massive corporate entity--it manufacturers everything from smartphones to washing machines, and essentially makes most of its components in-house, most famously mobile processors and displays. So by leveraging its various manufacturing branches, Samsung could bring its Ativ tablets to the U.S. at competitive prices. We're not talking Nexus 7 or Kindle Fire prices, but more along the lines of the iPad 2 versus the iPad with Retina display. A $400 Samsung Windows 8 tablet will still be a tough sell, but as Moorhead puts it, "It's a different value proposition." iPads are great for consuming media, but aren't as skilled at content creation. Microsoft's commercials may just be attacks against Apple's tablet, but they do make a good point: Windows 8 is better for multitasking and productivity. So when you put it that way, paying $400 for a Windows 8 tablet doesn't seem so outrageous. Samsung's vast resources will help in delivering a Windows 8 tablet at a reasonable price. All of Samsung resources will also come in handy as the company helps tackle Microsoft's biggest problem: No one knows Windows tablets exist. "We haven't see a lot of pure Windows tablets outside of the Surface," says Stephen Baker, vice president of industry analysis for the NPD Group. Indeed, putting aside Microsoft's marketing push on TV and online, Windows tablet makers haven't been doing much to increase Windows 8 tablet awareness. If you need a good example of what weak marketing efforts will do to a product, just look at Nintendo and the poor sales of its Wii U. But luckily for Samsung, this is an area in which the company thrives. It spends a ridiculous amount of money on advertising--way more than Apple or Microsoft--to make sure people know about its products and what makes them so cool. It's one of the reasons Samsung has been able to become the No. 1 smartphone maker in the world. With the power of Samsung's deep pockets, awareness for Windows 8 tablets can increase and the platform can continue to grow. 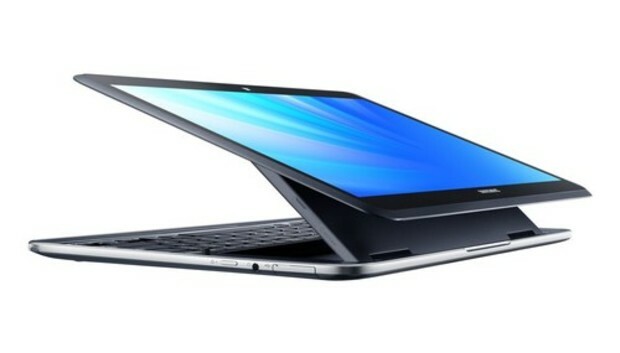 The Ativ tablets are just one catchy commercial away from being a household name, much like Samsung's line of Galaxy phones. Selling people on Windows 8 tablets won't be an easy task, but if anyone is up for the job it's Samsung. The company has the corporate--and financial--muscle to push Windows tablets into the mainstream, but Samsung also doesn't have the best track record when it comes to supporting mobile devices running Microsoft's OS. Before we get our hopes up too high that Samsung can save Windows tablets, we should also ask how long it'll stick by them before going back to exclusively making Android slates instead.